"The Great Art belongs to Eternity. It inevitably and invariably gives projection to the Future." An outstanding Russian pianist Maria Yudina once said this. And it could be said about her distinctive and significant performing art. Her presentation of a great number of compositions, from Bach and Beethoven to Shostakovich and Stravinsky, despite and may be because of the original and daring interpretation, even today projects some astonishing magnetic power thus expanding the frontiers of our perception to an unprecedented scale. A famous German composer Karlheinz Stockhausen once said that artists like Yudina picked up "the sound of time at a distance, then rendered a great impact on the present and influenced the future". This is what makes Yudina's performing art a part of spiritual culture. Maria Veniaminovna Yudina was born in Nevel, a provincial town in the Pskov region of Russia, on September 9, 1899. Even from her childhood she was notable for her indomitable temperament that became apparent both in everyday life and in her creative work. The scope of her interests was extremely wide and extended far beyond music. From her younger years she was in zealous search of a world outlook and yearned "to lean herself on the Pillar and Assertion of Truth". She adopted orthodoxy in 1919. Faith as the basis of the world outlook and the instrument of cognition determined unique features of her performing art with its richness of content and urgency of sound. Faith also became a cause of her adversities. Three times she was ousted of the institutions of music. For some time she was not allowed to give concerts and recitals or to travel across the frontiers of the country. When studying piano (since 1912) at the Saint-Petersburg Conservatoire under the tutorship of Kalantarova, Vl. Drozdov and L. Nikolaev she at the same time studied conductorship with E.Cooper, played organ and even percussion at the orchestra, studied special harmony and counterpoint, instrumentation and composition. In 1921 Yudina graduated from the Conservatoire with distinction and began an intensive concert and teaching practice. Her repertoire was extremely rich. It included not only classical and romantic composers but also names like Metner, Kshenek, Hindemith, Stravinsky, and later Prokofiev, Shostakovich, Berg, Bartok, Webern, Volkonsky. Yudina lived all her life in poverty and hardship. She even did not possess her own piano. For many years she wore the same dress. Very often she did not eat enough. All this did not disturb her. She was convinced that an artist was supposed to be poor. She always supported those in need, helped to rescue her friends from political exile during years of Stalin repression. Friends were here main wealth. They were a cream of Russian intelligencia, outstanding representatives of the Russian culture, Pastrenak, Zabolotcky, Favorsky, Falk, Florensky, Bakhtin, Yavorsky, Neuhaus. She wrote: "What is friendship? It's faithfulness till death and readiness to share spiritual gifts". After hear passing away (she died on November 19, 1970) she continues to share these gifts thus involving more and more people in the sphere of her influence. Her dream to play for the whole mankind has become true. This disc includes recordings of Beethoven's 15 Variations and Fugue and 33 Variations on a Theme by Diabelli. 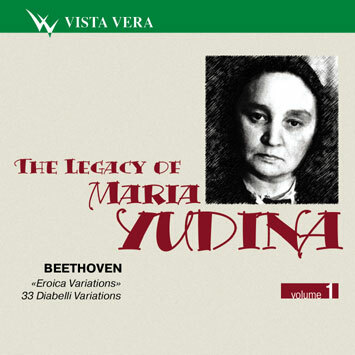 Yudina always showed a great interest to the genre of Variations. She tried to find a hidden philosophical meaning and an explanation of the nature and purpose of Variations. As I recall she wanted to get acquainted with the calculus of variations supposing with some naivety that mathematics could support her intuitive feelings. One thing can be said definitely: the genre of variations inspired her immensely. Absolutely unique are her interpretations of Goldberg Variations by Bach, of Brahms' Variations on a Theme by Hendel, Mozart's Variations on a Theme by Duport, Variations by Shimanovsky. Ludwig van Beethoven: 15 Variations and Fugue in E flat major op.35 "Eroica-Variations". A Contredance from Beethoven's ballet Creatures of Prometeus became a theme for these variations. More precisely - the bass sounds of the theme which very much anticipates the Finale of his Symphony No 3 "Eroica". Yudina introduces a truly symphonic scale into these Variations. It's not only an astonishing diversity of the orchestral timbres, not only a scale of the sound contrasts but also, above all, a sense of integrity of the form. So many-sided appears the theme and so many metamorphoses it undergoes and yet it always retains three notes si flat sounding sometimes menacing, sometimes awkwardly funny but always contrasting to the surrounding music. Here is an incredible charm and tenderness of the 5th variation, and then an unstoppable vital pulse of the 6th with its incomprehensible virtuosity, and then rubato and a light pedal crape of the 8th where one can sense an aroma of Vienna, an anticipation of Strauss. And then awkward dissonances of the 9th, and a flight of angels in the 10th. An insuperable power draws Yudina through the whole composition towards the 13th variation where the tension reaches its climax. A bass theme sounds intentionally rough, the grace-notes in high register appear too sharp, repeating chords in the middle register seem a bit monotonous. All this brings a grandiose culmination after which a desired peace of the 14th variation comes. And this in turn very smoothly with no pause flows to a brightened and richly ornamented Largo of the last 15th variation. Yudina plays it in an amazingly flexible and whimsical way. Only for a moment she plunges into deep meditation and then again gives herself up to a captivating inventiveness of the Fugue that triumphantly crowns the whole cycle. 33 Variations on a Theme of Diabelli, ор.120 was next to last Beethoven's piano work, another of his unresolved mysteries. Beethoven was writing the variations on a very unpretentious theme for several years taking pause in composing Symphony No 9. The variations sound fragmentary. One could assume that the composer sets some purely formal tasks: while preserving a metrical structure of a very simple 2-part form to present almost every small genre of the time. One can find there scherzo, etude, fuguette, saraband, fugue, minuet. And all this sums up into an inseverable and incomprehensible great whole. Maria Yudina pondered over the sense of these variations in the course of years. About 14th variation, Grave e maestoso, she wrote: "It's like Pergamon Altar, bars are like its marble slabs. Here you see, crawling from one slab to another, hooves, tails, manes, shoulders, faces of gods and giants distorted by the horrors of fighting and the whole of epic…The scale of the music is prehistoric…superhuman". The 21st variation attracted her very much too. "This is one of the best. It's contrasting - here is "brio" and there is expressive meditation…It's a very tempting and enigmatic picture". And several years later Yudina came to the conclusion that this music reflects "a dramatic argument of the soul inside yourself, for your felicity…In other words, ein Mikro-Makro Kosmos"
Convincing is Yudina's concept of the last three variations. About the 31st, Largo, molto espressivo, she wrote that it was Passionsartig, i.e. Passion-like. Indeed Bach's image appears in an easy melody of recitative, in synkopes and ritardandos. Very naturally comes Fugue of the 32nd variation. It's bright, impetuous, and contrasting. But it flies rapidly too with a stormy roll of a diminished seventh. The spirit of Beethoven soars over us again. The 33rd variation, most fascinating as Romain Rolland once said, begins. Maria Yudina writes: "Is it a Minuet? Of course not. It's "Praise the Name of God", "Let every thing that hath breath praise the Lord", or, like in icons "Praise to the Mother of God", birds and animals of paradise, or, like in medieval miniatures, plants with inimitable tendrils resembling Paul Klee's lines, and rejoicing of colours in icons and miniatures. It's an Acme Point. Everything has been praised for 32 times, now it's Amen. It's a sin to play the last chord F! Like an expulsion from Paradise. Beethoven must have made a mistake because of his deafness". It is strange that Yudina does not talk here about an obvious intonational likeness of the music of this variation with the theme of Arietta (Adagio molto semplice e cantabile) of the Sonata op.111. And not only intonational. Yudina interpreted the music of the Arietta as a sojourn in another reality. Coda of the Variation as Yudina plays it sounds like a flight into celestial spheres where a carefree and pure soul is taking a bath in the beams of Sun.